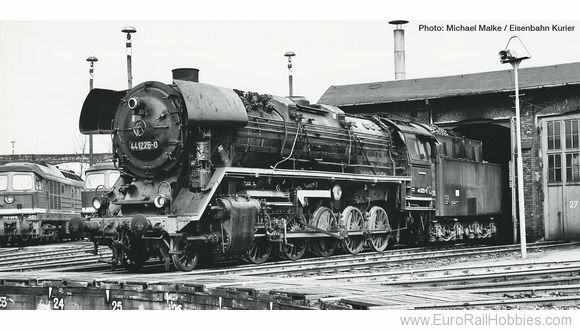 Steam locomotive 44 1225 and trailing tender of the Deutsche Reichsbahn. Epoch IV. Mold variant with new boiler and coal destruction. Triple headlights. Motor with flywheel. Drive on two axles. Traction tyres. Interface according to NEM 651 standards for the adaptation of a decoder. Coupler pocket according to NEM 358 standards. Model with digitally switchable Henning sound functions.